After thorough deliberation we have concluded that mankind will greatly benefit through Sri Gauranga Samaja, the society of Sri Gauranga. Srila Vrndavana dasa Thakura has said “ye va mane, ye na mane, saba tanra dasa– Everyone is a servant of Sri Caitanya, even if some accept Him as Bhagavan and others do not.”* Indeed, every Gaudiya Vaisnava accepts that Sri Gauranga Mahaprabhu is Sri Krsna Himself, the Absolute Truth. Constitutionally, every living being is a servant of Sri Krsna. However, many do not accept this because they are afflicted by offences. Such people will certainly neglect this Sri Gauranga Samaja, so what will the society do but remain indifferent to them? Those who hold Sri Gauranga Mahaprabhu in high regard will participate in this society with one-pointed focus. What doubt can there be in this? Three types of people have faith in Sri Gauranga Mahaprabhu: (1) those who have faith that He is the Supreme Lord, (2) those who have faith that He is the topmost devotee, and (3) those who categorize Him as a great personality. However, as all three types respect Sri Gauranga Mahaprabhu, they can be included within His society. Those who perform bhajana of Sri Gauranga Mahaprabhu, knowing Him to be the Supreme Lord, are His one-pointed devotees who are counted among His intimate associates. This category is further divided because even though some people know Sri Gauranga to be the Supreme Lord, they may not consider Him the object of their bhajana. Nonetheless, there is no doubt that everyone in this particular category demonstrates love for Sri Gauranga. Those who consider Sri Gauranga to be the topmost devotee will certainly propagate love for Sri Gauranga Mahaprabhu (gaura-prema) from time to time, even if they belong to another sampradaya. Persons in this category can never become disinclined to the promotion of Sri Gauranga Samaja. And those who consider Sri Gauranga Mahaprabhu to be an ordinary devotee and a native social reformer also belong to His community. If the second and third categories are not included in the society of Sri Gauranga, then this society cannot be said to benefit the public at large. Taking care to bring them within the community of Sri Gauranga is thus an intelligent act. Accordingly, the conclusion is that the society of Sri Gauranga comprises those great souls who hold Sri Gauranga as an ideal. One question must be considered here: Does Sri Gauranga approve of such a society or not? If we examine the sastras pertaining to bhakti we will observe that Sri Gauranga personally established the foundation of such a society during His prakata-lila, or manifest presence. O reader, do you remember that in the holy place of Varanasi a grand assembly was held in honour of Sri Gauranga Mahaprabhu? It was organized by the brahmana from Maharastra, who was an exceptional devotee and an associate of Mahaprabhu. He invited all the Sankarite sannyasis and other paramahamsas of Kasi and specifically requested Sriman Mahaprabhu to join that assembly so that Mahaprabhu would bestow His mercy upon them all, as well as manifest some of His opulence. Astonished upon beholding Sriman Mahaprabhu’s grandeur, those sannyasisrose from their seats and offered Him – the Lord of our hearts – the most elevated sitting place. The next day Sri Caitanya Mahaprabhu went to that brahmana’s residence and saw the sannyasisof Varanasi sitting there. Sitting on the ground, Sri Caitanya Mahaprabhu revealed His mystic power by manifesting extremely effulgent bodily lustre as bright as millions of suns. Sri Caitanya Mahaprabhu’s brilliant bodily effulgence attracted the minds of the sannyasis, and they respectfully rose, giving up their sitting places. Prakasananda Sarasvati, however, personally caught Sri Caitanya Mahaprabhu by the hand and with much honour seated Him in the midst of the assembly. After hearing the sweet words of Sri Caitanya Mahaprabhu, the minds of the Mayavadi sannyasiswere moved, and thus they spoke pleasing words. If one does not understand Sri Caitanya Mahaprabhu’s wonderful life and pastimes but nonetheless continues to hear about them again and again, love for Krsna will be aroused. Gradually one will come to understand the tradition of rasa, the loving affairs between Krsna and the gopisand other associates of Vrndavana. Thus, simply hearing about Sri Caitanya Mahaprabhu awards the highest benefit. According to the scriptures, there are three categories of Vaisnavas: uttama, madhyama and kanistha. Among them, the uttama-vaisnava, or topmost devotee, does not belong to any society. Nonetheless, his merciful presence in Sri Gauranga Samaja will bring it much benefit. 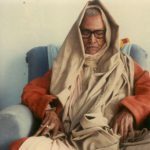 He inherently sees all beings in relation to Bhagavan and therefore he does not differentiate between what belongs to him and what belongs to someone else. Because he sees every living entity as situated within the Supreme Absolute Truth, He does not distinguish between friend and enemy, or devotee and non-devotee. Sri Caitanya Mahaprabhu descended with the mission to propagate the importance of chanting the holy name. Now He is accomplishing His own mission through you [Sri Haridasa Thakura]. Daily you are chanting 300,000 holy names and speaking the glories of the holy name before all. Some persons behave properly but do not preach the glories of chanting sri nama, whereas others preach but do not behave according to the principles. In relation to the holy name you both behave in an exemplary way (acara) and preach to others (pracara). You are the guruof all, for you are the topmost devotee in this world. The Vaisnavas on the madhyama, or intermediate, level remain under the guidance of uttama-vaisnavas, and are the benefactors of kanistha-vaisnavas, neophyte devotees. Therefore, uttama- and madhyama–bhaktas are qualified for the bhajana section of Sri Gauranga Samaja. * Although they may occasionally participate in the activities of the working section, they do not manifest their competence in such work like the kanisthadevotees, who are fond of it. However, with the assistance of the kanistha–vaisnavasthey accomplish whatever work needs to be done. 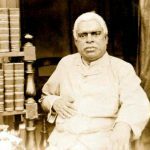 * According to Srila Bhaktivinoda Thakura, the society of Sri Gauranga has two divisions: the bhajana section and the section that focuses on external work. The division a person belongs to depends on his adhikara, or qualification. Vaisnavas in the bhajana section of Sri Gauranga’s society commonly take pleasure in nirjana-bhajana, or solitary absorption in the holy name, and in istagosthi (a gathering of like-minded devotees in which they discuss their ista, worshipful Lord, and thus attain much satisfaction and pleasure). There are two types of istagosthi: personal practice (acara) and missionary work (pracara). To maintain their practices, such Vaisnavas remain engaged in reciting and hearing scriptures like Srimad-Bhagavatam, and in performing harinama–kirtana. At the time of preaching, they impart knowledge of bhagavat-tattva, jiva-tattva, rasa-tattvaand the glories of the holy name of Sri Hari, according to the qualification of the listener. 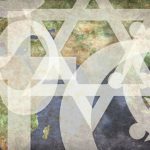 prabhu kahe, – “kaha, kene kara sankoca-laje? Without the association of suddha-bhaktas*, or pure devotees, there is no question of holding an istagosthi. * One of the definitions of suddha-bhaktagiven by Srila Bhaktisiddhanta Sarasvati Prabhupada is one who is free from the desire for wealth, women and fame. Every day Sri Caitanya Mahaprabhu would come to meet them both (Sri Svarupa Damodara and Sri Raya Ramananda) and in their istagosthi they would discuss krsna-kathafor some time. 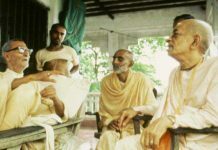 When Jagadananda Pandita and Sanatana Gosvami sat together for a krsna-katha-gosthito discuss Krsna’s pastimes, Sanatana Gosvami submitted to Jagadananda Pandita the cause of his sorrow. 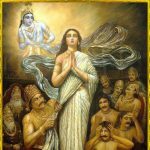 The purport is that when all types of people congregate in assemblies organized by devotees or faithful people, a general assembly of Gauranga is formed. A congrega-tion consisting solely of devotees is called a Vaisnava assembly, or an istagosthi of Vaisnavas. When two suddha-bhaktas meet, a krsna-katha-gosthi takes place. And when a single suddha-bhakta resides somewhere to exclusively chant the holy name, it is a place of nirjana-bhajana, or solitary devotional practice. The people in all these categories are included in Gauranga’s society. It can therefore be concluded that the purpose of Sri Gauranga’s congregation is to cultivate activities related to the eternal, constitutional occupation of the living entity (jaiva-dharma) throughout the universe. By the inspiration of Sri Gauranga Mahaprabhu, Sri Gauranga Samaja has been established in the vast city of Kalikata (Kolkata). This is a matter of extreme good fortune for the public. Now it is the responsibility of every noble-hearted, genuine seeker of the Truth to work on promoting and preserving it. This society will not remain undisturbed unless its members vigilantly avoid selfishness, hypocrisy and the desire for honour and prestige. Dear father, the Supreme Lord is one for all living entities. The difference between the Muslim God and the Hindu God is in name only. All scriptures, whether the Koran or the Puranas, state that there is only one Supreme Lord. He is the non-dual, eternal, transcendental Absolute Truth, infallible and perfectly complete, and in that capacity He resides in everyone’s heart. The Supreme Lord’s transcendental name and qualities are glorified throughout the world by various scriptures. The Lord accepts each individual’s mood of surrender. When you are violent to others, you are being violent to the Lord Himself. My body may be cut into pieces or I may lose my life, but I will never abandon uttering the holy name. * When all types of people congregate in assemblies organized by devotees or faithful people, a general assembly of Gauranga is formed. During the day, Sri Caitanya Mahaprabhu performed nrtya-kirtana, dancing and chanting, and He also took darsana of Lord Jagannatha. At night, along with Raya Ramananda and Svarupa Damodara Gosvami, He tasted the nectar of rasa. This implies that there is no pleasure in discussing rasa in the association of general people, and that such discussions will substantially impede one from relishing rasa. This hindrance does not appear in an istagosthi. It is necessary to preserve the etiquette of kirtana when nama-kirtana is performed. In this regard it is also necessary to decide what is most effective. If the members of the Vaisnava society themselves perform kirtana, that kirtana will bear the most fruit. 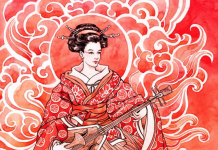 Listening to the kirtanaof hired musicians who perform for remuneration is both offensive and fruitless. It is vital that Sri Gauranga Samaja exercises great care in its preaching. Discourses and instructions should be strictly in accordance with the teachings Sri Gauracandra, bestowed upon the jivasof Kali-yuga out of His boundless compassion. The responsibility to preach is best given to the members of the bhajana section. Mere eloquence cannot make one a preacher of Sri Gauranga’s teachings. If some young, learned great souls attend istagosthis of the bhajanasection and therein discuss in a simple-hearted way the teachings of Sri Gauranga, they will quickly become adept preachers. If the society of Gauranga consists of preachers who do not have the understanding that the Lord’s name (nama) and the Lord Himself (nami) are non-different, and if they do not have faith that this non-different reality is the Supreme Absolute Truth, parama brahma-tattva, they will not confer any welfare to others. Rather, their preaching will only have a negative effect. This is most vital. The only qualified preachers are those who have acquired knowledge about the intrinsic nature of suddha-bhakti, and who relish nama-rasa, the nectar of the holy name, being completely free from offences. It is essential for all preachers to be fully acquainted with nama-aparadha, offences to the holy name of the Lord. Those who are aware of these offences are qualified to preach the glories of the holy name. In disseminating the glories of the holy name, one must also give instructions about the necessity of consciously avoiding nama-aparadha. Preachers who do not do so will themselves become offenders to the holy name. Previously, we explained that a society of Sri Gauranga that does not accommodate all types of Vaisnavas will be short lived. That said, the fact is that a society founded with visuddha-vaisnavas, or pure devotees on the transcendental platform, as members is to be regarded as the true Sri Gauranga Samaja. 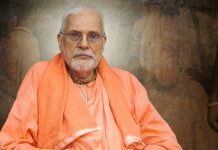 Among the various Vaisnavas in such a congregation, the visuddha-vaisnavas are immersed in the bliss of bhajana, and are mostly inactive in developing their worldly life. Until those who have an inclination for bhajana become specifically immersed in the bliss of bhajana they can engage in activities to advance their worldly life. However, if they do not get the association of Vaisnavas who are immersed in the bliss of bhajana, they will become completely materialistic within no time. For such people, it is nothing but self-deception to establish and promote themselves as representing the society of Sri Gauranga, without associating with suddha-vaisnavas. One may certainly be engaged in spreading the holy name of Sri Krsna Caitanya while living with extremely materialistic people. 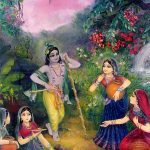 But without having the association of Vaisnavas who are deeply absorbed in the bliss of bhajana, one’s life will go in vain and gradually one may fall down. Those in the society of Gauranga may see this happening to certain members. However, if they still do not seek the association of those devotees who are deeply absorbed in the bliss of bhajanaand include them within their society, what will become of their society? We cannot say. Nowadays it is seen that the members of Sri Gauranga Samaja are not performing any special activities beyond celebrating the festival of Mahaprabhu’s appearance. It does not seem that by holding assemblies in the homes of two or three materialistic people anything significant will be accomplished. If they simply try to satisfy the materialists, anarthaswill gradually arise in them. 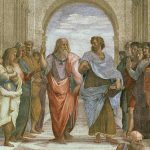 By agreeing with the opinion of materialistic people they will continue to float on the unending wave of impersonalism. To propagate bhakti to Sri Gauranga, it is essential that in taking the help of materialistic people, one is not obliged to agree with their understanding. To accept conceptions that oppose the teachings of Sri Gauranga in order to satisfy the minds of materialistic people is utterly inappropriate. Respect all beings in this world. Try to remove the suffering of every living entity. While living with others, try to act for their welfare. Never forget, however, to follow the supremely ideal character and absolutely essential instructions of Sri Gauranga. In every city, perform sri krsna-sankirtanaand propagate Sri Gauranga’s teachings. O devotees in Sri Gauranga Samaja, go from door to door with the scripture Sri Caitanya-caritamrtain your hands and spread the name and teachings of Sri Caitanya Mahaprabhu. Just as Sri Mahaprabhu ordered Sri Nityananda Prabhu and Sri Haridasa to travel everywhere and preach, you also become the servant of Sri Gauranga and go to every country, engaging honest people in circulating Sri Gauranga’s message. This preaching mission cannot be accomplished by dishonest people. Immediately establish a Vaisnava school for this purpose. Educate some selfless people of good character and give them the responsibility of itinerant preaching in every town and village. Most blessed indeed are they who can do this. Those who do not follow such a formula will simply be imitating the supremely pure character of Sri Mahaprabhu.